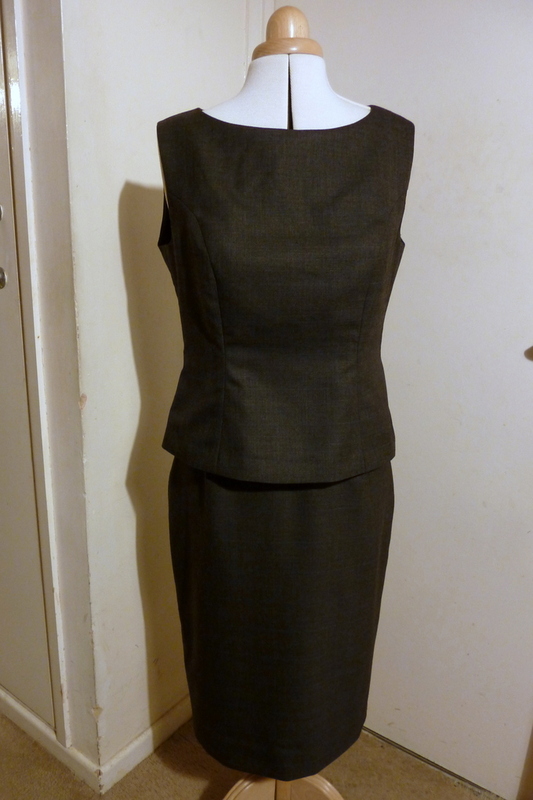 My sister’s dress has reached her now, so I can show the whole thing on the blog! It’s Vogue 2218, a two piece dress pattern with a lot of sleeve and neckline variations. We picked the sleeveless boat neck version. In passing, I found it really difficult to take decent photos on the dressform. Some of this is the time of year. I get up in the dark and come home in the dark at the moment; daylight is weekends only! But I think some of it is that clothes just look much better on a real body. This is a good pattern. It’s very versatile and you can make it as simple or as complicated as you like. It was a long project for me because of the fabric choice but it wouldn’t have to be if made in a solid. It’s a shame it’s gone out of print. Next time (daylight and snow permitting) pictures of a project that’s the complete opposite of this one: a quick knit dress in an alarmingly sparkly fabric. I’m all about the frosting. 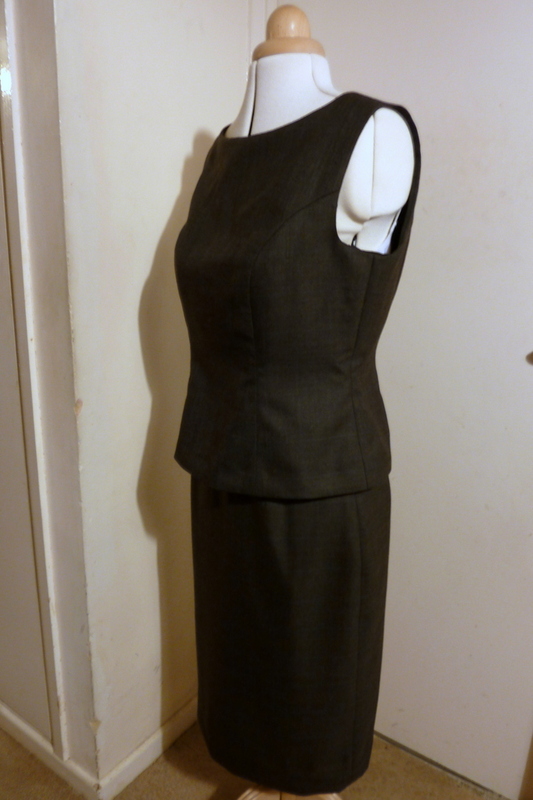 Posted on January 13, 2013 January 11, 2017 by catherinedaze	This entry was posted in dressmaking, Finished, sewing, vogue and tagged dress, dressmaking, sewing, vogue. Bookmark the permalink. Good work! Very elegant. Lucky sis she is. That’s very pretty–chic. Nice sewing! Really smart looking, hope your sister loves it! I will have to look that pattern up – surprisingly I don’t seem to own that one! I opened this up and recognized the pattern right away! It’s a great pattern with a lot of potential. You made your sister an awesome dress! I’m sure she was so grateful to receive it. This is fantastic! Really professional finish and just perfect for the office (and then on to evening drinks!) Love it! This is so chic! I love it! You’re such a sweet sister! It looks so smart! Your sister is one lucky lady, and you are one generous and talented sister! Even so on the dress form it looks fantastic. Very cool and chic. Ooo sparkly …. can’t wait. Love this! I just ordered the pattern from ebay. Thanks for sharing. I have been wanting to sew a similar project and had not seen this pattern!!! Hope mine turns out as nice as yours. I want a sister like you! hehe, the suit is really impressive and it has a look like “Mad Men”, great job! I love it! This is gorgeous. Did you ever find a good supplier of cupro? If not, have you tried http://www.macculloch-wallis.co.uk/Product.aspx/Linings!2130? At £8.33 per metre (140cm wide) it seems a good price and if you click the ‘more colours link next to the colours drop down box, they have a good range. You’ve probably discovered this or better by now!